Who doesn’t love a contest? Strawberry is looking for volunteers to post our flyer for the upcoming Fall Festival, and that seems like as good as excuse as any to give away tickets. At 3pm, on Monday, August 20th, we will draw five lucky winners to each receive a pair of Adult 4-Day camping tickets to the Fall 2018 Strawberry Music Festival. To enter, all you have to do is print and post our flyer to your favorite public bulletin board and send us a selfie of yourself with the posted flyer. Every photo submitted, in a new location, counts as an entry, so the more flyers you post and photos you submit, the better your chances are to win. Please only post flyers where you have permission by the property owner and make sure that every photo is taken in a different location. Photo submissions will be shared on Strawberry’s website and social media platforms. Open and print Strawberry’s Fall 2018 Flyer. Post flyer on local bulletin boards and in public places, with permission from property owner. Take a picture of yourself (or have a friend take a picture of you) with your posted flyer. Via email, send your photo to info@strawberrymusic.com. On Instagram, tag us by including @strawberry_music_festival, as well as the hash tag #StrawberryFall2018, in the text of your post. 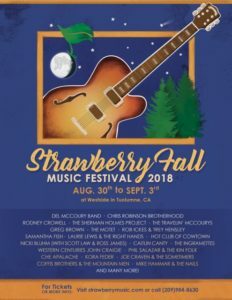 On Facebook, post your photo on the Strawberry Music Festival – Fall 2018 event page at https://www.facebook.com/events/441534702946571/. On Twitter, tag us by including @berryfest, as well as the hash tag #StrawberryFall2018, in the text of your post. Please do not duplicate your entries on more than one social media platform. One picture submitted, of one flyer posted, is one entry to win. If you have questions about the festival, or want to buy tickets, call us M-F, 9-5 at (209) 984-8630. Thank you for helping us to spread the word about Strawberry, good luck, and we hope to see you all there!